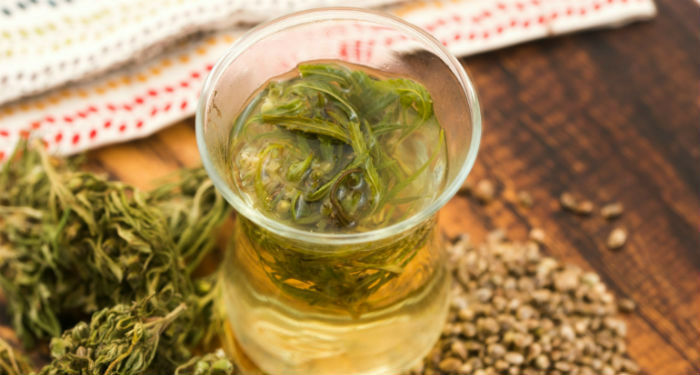 From high-inducing THC tea to calming CBD tea, it's easy to make cannabis tea at home. Most people have heard of smoking cannabis and making marijuana-infused edibles, but many people aren’t aware that it’s possible to make marijuana-infused tea. A healthy alternative to consuming cannabis via smoking it, marijuana tea is easy to customize to achieve different tastes and desired effects. This is probably why people have been enjoying marijuana tea for hundreds of years. Rather than smoking or eating it, some people opt for a hot cup of cannabis tea. Cannabis tea isn’t new; in fact, it dates back to ancient times. Over the centuries, it’s been used differently across various cultures. 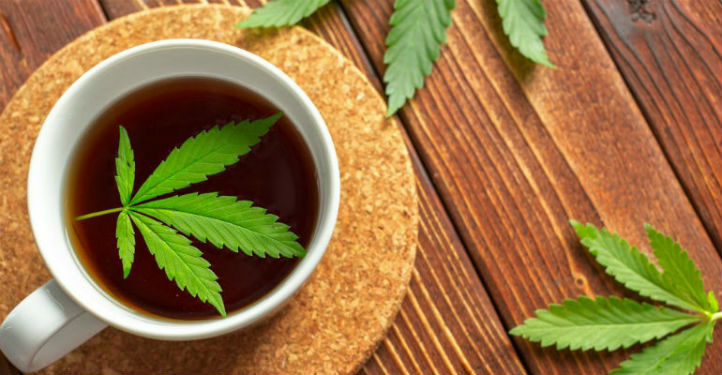 In many places, marijuana tea has been traditionally consumed for medicinal or ceremonial purposes, while in others, people consume it simply for the pleasure of getting high. One of the earliest communities to embrace cannabis tea was Jamaica; it’s traditional for pregnant mothers there to use marijuana to help combat worry, anxiety, and morning sickness. (Note: healthcare experts advise against the use of cannabis while pregnant.) In Jamaica, cannabis is referred to as “ganja,” and ganja tea is used as a common medicinal remedy there, particularly in the rural areas. According to news reports, one Jamaican politician even claimed that he used ganja tea to treat his daughter’s asthma. Ganja tea is typically made from young plants that have not fully developed for harvest, which means the brew is less potent than smoking dried mature buds. Another country where cannabis tea can be traced back hundreds of years is India, where the beverage was first used in 1000 B.C. The hot drink, referred to as bhang, is still widely consumed in India today. Bhang is a combination of milk, marijuana, and spices, with the dry contents being ground using a mortar and pestle. Bhang is primarily consumed for ceremonial reasons; it’s often presented as an offering to the Lord. This is because cannabis is listed as one of the five most sacred plants in the Atharva Veda, a sacred text in the Hindu religion. Indian families often serve bhang to important guests at dinnertime. Marijuana tea is also used as a remedy for fever, sunstroke, or digestive difficulties. Marijuana tea has a long list of health benefits, all of which come from the cannabinoids found in the cannabis plant. THC, for example, is effective at calming pain and treating insomnia. Some people undergoing cancer treatment use THC to quell their nausea. CBD is also a useful painkiller and can help settle anxiety. Because marijuana tea effects set in slowly and last a long time, it can be helpful form of cannabis for medical patients needing long-lasting relief. Consuming these cannabinoids in the form of a hot beverage is incredibly soothing; it’s also a very subtle way to ingest cannabis either recreationally or medicinally. Marijuana tea benefits include pain relief, calming anxiety, and treating insomnia. Much like consuming marijuana-infused edibles, the marijuana tea high is described as a more mellow high than smoking or vaping marijuana. People who consume marijuana tea report feeling mildly euphoric and renewed. Also similar to edibles, marijuana tea effects don’t kick in right away. They can take half an hour or as long as 90 minutes to appear. This is because rather than being inhaled into the lungs (where the cannabinoids are immediately absorbed into the bloodstream), the tea must go through the digestive tract. Because of this, those who are new it its effects are advised to start with a small amount, as it’s easy to overconsume before the initial effects set in. When smoking marijuana, the effects wear off rather quickly, but marijuana tea can last several hours. This makes it a particularly useful remedy for pain, insomnia, or any condition in which the patient wants to avoid having to take repeated doses throughout the day or night. Marijuana tea effects kick in slowly and are long-lasting. There are many commercial cannabis teas available on the market, but one of the basics of cannabis 101 is learning how to make it at home. There are many different variations of cannabis tea depending on individual taste and the desired effect. The beverage can range from a light, non-psychoactive tea consumed to enjoy the health benefits of marijuana to a thicker, more creamy brew that will bring on a mellow high an hour or so after consuming it (similar to marijuana-infused edibles). Some people choose to brew tea using cannabis flowers, while others prefer to make marijuana tea with stems. Brewing marijuana stem tea is an excellent way to make use of stems leftover after the buds are removed, although any concoction made with stems won’t be as psychoactive as buds that are filled with THC. No matter which material is used, the steps for making various kinds of tea are the same. To make a mild, non-psychoactive cannabis tea, simply steep the stems or broken-up flowers in hot water just as with regular tea. Some people enjoy adding in other herbs, spices, or tea leaves to customize the flavor. This is an excellent way to enjoy the health benefits of the cannabinoids from brewed cannabis flowers or cannabis stem tea without feeling high afterwards. To experience a high from cannabis tea, two things are necessary. The first is decarboxylation (heating cannabis enough to activate cannabinoids like THC); the second is solubility. This means that anyone hoping to make tea that will have noticeable euphoric effects needs to decarboxylate their marijuana before brewing it. This can be accomplished by breaking it into small pieces and baking it in an oven at 230 degrees Fahrenheit for about 40 minutes, stirring the material so it heats evenly. 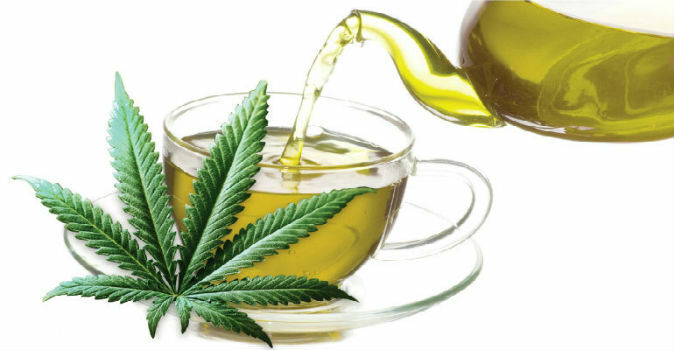 Next, a potent marijuana tea requires some sort of fat to bind to the THC (which is not water-soluble). Half a cup of milk or a tablespoon of butter or coconut oil will work wonderfully for this. Pour 3 cups of water into a saucepan and add in the fat, allowing it to melt and bringing the mixture to a boil. Then add a gram of cannabis and simmer for at least 15 minutes to thoroughly infuse it. Strain the contents through a coffee filter to remove all solids. 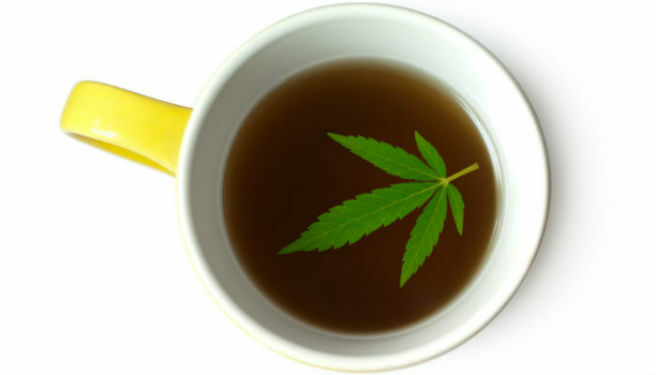 This is a basic marijuana tea; it can be consumed as-is, combined with spices, or even brewed for a few minutes with black or herbal tea leaves to customize the flavor. Another option? Put a pinch of kief into an already-brewed cup of regular tea to turn it into a cozy, high-inducing cup of kief tea. Many people also enjoy relaxing with a hot cup of CBD tea. Because CBD is non-psychoactive, this is an effective way to treat anxiety or pain without experiencing the high or negative side effects such as edginess or paranoia sometimes generated by THC. CBD tea is also an excellent sleep aid for those who are struggling with insomnia. CBD can be found in certain high-CBD strains of marijuana, but it’s also available in large amounts in hemp. This is a great choice for people who wish to avoid even trace amounts of THC due to employer drug testing or unwanted side effects. Like THC, however, CBD is not water-soluble, so it’s important to add milk, butter, or coconut oil to the water in order to ensure absorption when it’s consumed. Because it’s such an unusual way to consume marijuana, the topic of cannabis tea often generates questions. Here are some of the most common ones. Can you make tea with marijuana? Absolutely! It’s possible to make marijuana tea with the stems or flowers of the plant (or even the leaves, for people who grow their own and have trimmings). Many people also enjoy making kief tea by sprinkling a pinch of kief into the already-brewed tea of their preference. Does weed tea get you high? It depends. Cannabis tea brewed with no oils to bind the THC won’t cause intoxicating effects. Adding a fat such as coconut oil, butter, or milk will help the THC bind and infuse, creating a psychoactive marijuana tea. Meanwhile, CBD tea has no psychoactive effects. How long does weed tea take to kick in? Like the effects from cannabis-infused edibles, marijuana tea effects take time to set in. For most people, they can take anywhere from 30 to 90 minutes to become noticeable. Those who are inexperienced with cannabis tea are advised to start with small amounts until they’ve established a tolerance level. Marijuana tea can be made from the stems or the flowers of the plant. To maximize the benefits of cannabis tea, it’s best to follow the same rule given to those trying edibles for the first time. Start with a small amount and low dosage, especially if consuming THC tea. Then keep in mind that marijuana tea effects can take an hour or more to kick in. From a soothing, non-psychoactive CBD tea to a cannabis-infused chai that tastes great and soothes the drinker off to sleep, the flavors and effects of marijuana tea can vary wildly depending on how it’s brewed. This makes it an excellent medicine or treat for those looking for something beyond a pipe, brownie, or bong.